Below are a couple of responses I posted in Weaver's Words when the question was posted concerning applying finishes to baskets. Tung Oil as a stain - Tung oil is a sealant and not a stain. It is going to seal the fibers of your basket and make the weaving rigid. If you are making a Nantucket style basket then this is fine, but for use on a reed, oak, willow, ash basket it is not advisable. You could use it on a wooden handle or base, but I wouldn't use it on the weaving. If you want to darken or color your basket I would suggest using Minwax brand wood stains diluted with mineral spirits or turpentine. [As] most weaving materials are going to absorb stains very quickly, you will get too dark of a color if undiluted. You can also stain your baskets with a number of natural stains like very strong tea or coffee. Some basket stains may say they contain tung oil, but it is very diluted and if colored must includes some kind of pigment as tung oil itself is basically clear. 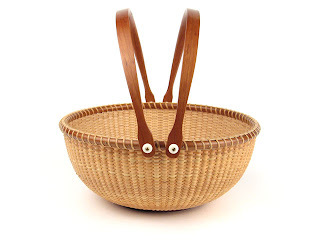 Lacquer on baskets - Unless you are making a Nantucket basket or traditional raffia stitched coiled pine needle basket I would never apply a lacquer, varnish or polyurethane to the weaving of a basket. If you want to apply a finish to the handle or a solid wood base that is fine, but the weaving needs to be able to breath and flex. The wood in furniture is also affected by humidity and fine woodworkers take that into account when connecting certain pieces together. Many joints are held together only on three sides to allow for this expansion and contraction. With a woven basket you have hundreds if not thousands of points of contact between thin pieces of wood and each one of those needs to be able to move. Now concerning dirt and finger prints you are going to get different opinions, but this is what gives antique baskets that wonderful dark color which antique dealers love to call patina. I love when I set a new basket up next to a 10 year old or even 5 year old basket, [with time they] just develop the most beautiful color and the ones that are used and handled often even more so. 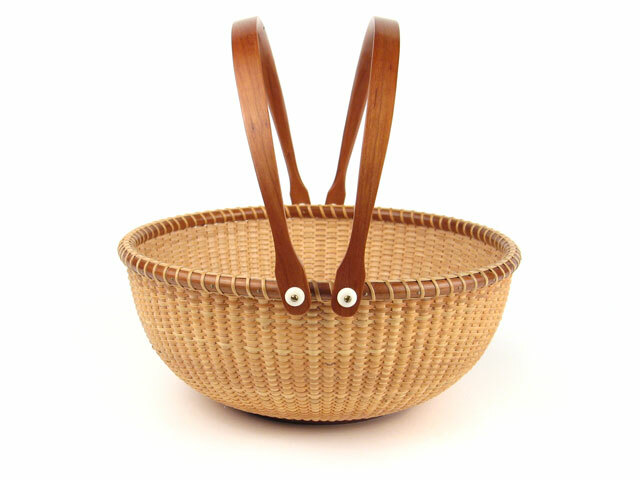 So, in general for cabinetry and furniture finishes are great, but for baskets (except in a few odd exceptions) they are a no-no.